Built in 1877 as a Free Church. Designed in a Gothic style by Donald McMillan with nave and corner spire. 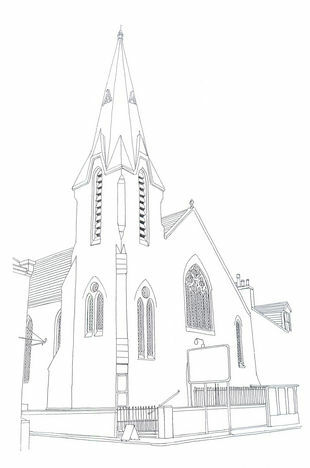 The Acorn Centre was created in 2008: the church was split in two by adding a new floor at gallery level to give a worship, conference and concert facility upstairs and a hospitality area downstairs meeting the needs of a whole range of people in the community. The original features of the church are retained, including a stained glass rose window, while the change is announced by the new glass porch. Contact Inverurie West Parish Church.